This feature article, published in the International Journal of Communications, describes The Playmaker Strategy System (System 2), a patented table and ontology of irreducibly unique stratagems, likened by its architect and the author, Alan Kelly, to exhaustive frameworks in chemistry, biology, and music. The system, which allows users to definitively decode, define, and anticipate the plans and programs of communication and influence professionals, is contrasted with the works of Dr. James E. Grunig, the communication scholar and author of The Excellence Theory among other seminal works. 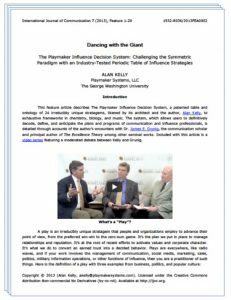 In this video series, a companion to the feature article (above), “Dancing with the Giant,” Alan Kelly, CEO of Playmaker Systems and architect of the Playmaker ontology, and Prof. James Grunig, Ph.D., the communications scholar and author of The Excellence Theory among other seminal works, discuss their respective theories and ways in which they conflict and complement one another. It is a contrast between what to Mr. Kelly is practical and actual and, to Dr. Grunig, positive and normative or, in lay terms, a meeting between strategy and symmetry.